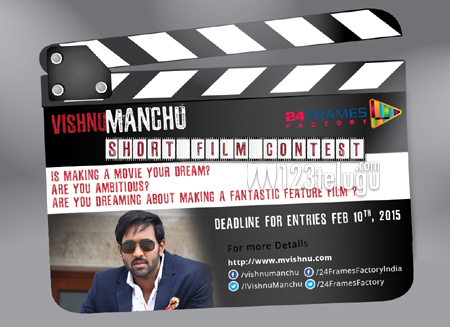 Vishnu Manchu’s 24 Frames Factory announced today that 102 contestants have cleared the preliminary round for inaugural edition of ‘Vishnu Manchu Short Films Annual Contest’ . The short films submitted by these contestants will now be watched and evaluated by the jury. Thereafter, the first list of candidates who will move to the next level will be revealed tomorrow ( 12th Feb 2015). The theme for 1st level will also be revealed on the same day. Vishnu Manchu is elated with the overwhelming response to the competition. This initiative by 24 Frames Factory is a baby step to spot talents that is in waiting to breakout in the world of cinema. The response we garnered has boosted our belief that this idea has an appeal and opens a window of opportunity to newer filmmakers. The public can view the shortlisted films on 24 Frames Factory official YouTube channel. The viewers can watch these short-films and rate them through liking them. Their input and remarks about the short-film will also be taken into consideration while the jury judges these short-films.